Wow, I've been putting this review off for a long time. I probably first announced that I'd write it back in January and then again a few weeks ago, and I'm just now finally writing the thing. It's not that I'm not motivated to write about the figure, it's that I'm really writing about four figures. 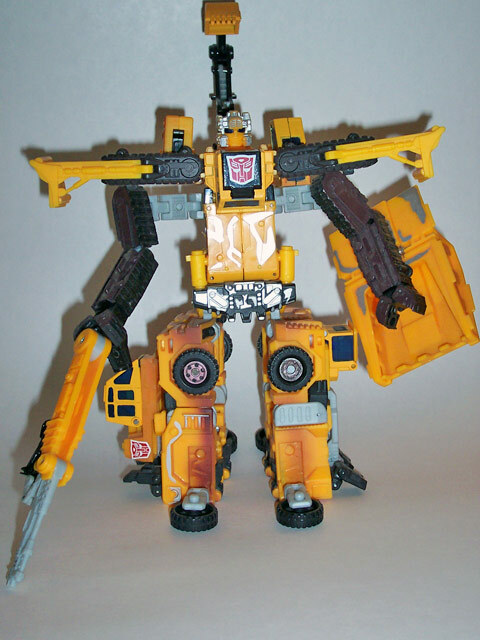 I could separate each of Landfill's component Autobots, but this isn't regular old Landfill. This is the Walmart exclusive set. Painted like actual construction equipment and selling for $15, I don't understand how someone could complain about this deal. I paid $15 for a knockoff of the original version of RiD Landfill and it literally crumbled in my hands twenty minutes after opening the packages. The figure is fairly commonly hated because it cost $40 to get all the parts for the gestalt, the individual robot modes were crap, the gestalt mode was kind of iffy, and the colors were insane. Well, the individual robot modes are still crap, and the gestalt form remains iffy, but at least it's cheap and has a spiffy paintjob. 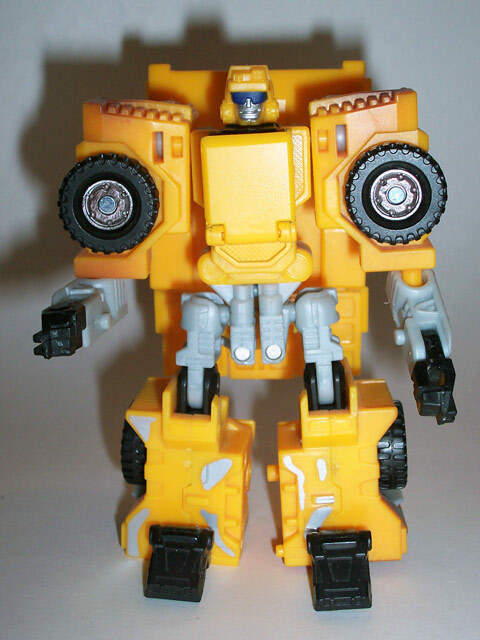 No, this version is not worthy of the scorn so many have for the original RiD Landfill figure. I figure I'll talk about this first since it's the real reason to buy the set. 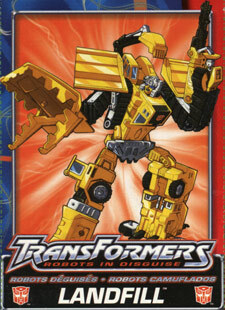 I don't think the Landfill gestalt is that bad provided you use Grimlock for the arms. Using Hightower or Heavy Load for the arms looks bizarre because the hands look far worse than claws made out of machine treads. Hightower's rifle makes for a nice gun in this mode and Heavy Load's truck bed is theoretically a claw or a shield, but ends up just looking like a dump truck bed attached to the underside of the arm. The arms are the only real articulation in this mode, and even then only at the elbows. You can move the legs slightly, but there's really very little you can do with them and still allow the figure to stand. This version looks loads better with its uniform color scheme and makes for a decent display piece in this mode. 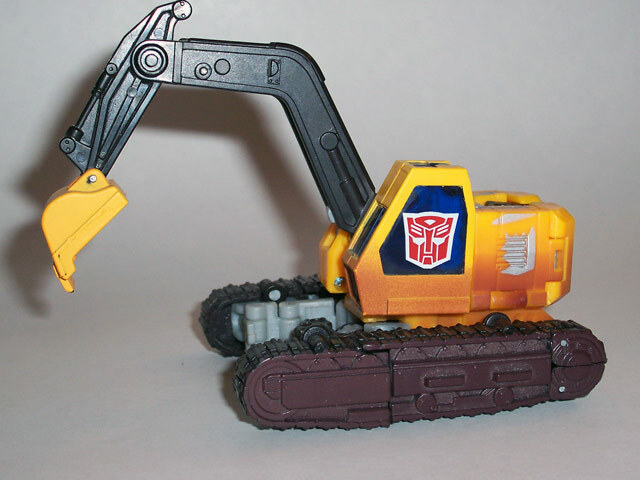 I was kind of surprised that Landfill wasn't repainted to resemble G1 Devastator (though he does resemble my G2 Devastator in color) and released under the Universe line as a Decepticon. Something else of note about this version is the "hurricane mode" displayed on the box, but not shown in the instructions. The mode basically involves manipulating Wedge's treads so that they're positioned about where they would be in his regular vehicle mode and positioning Grimlock's treads differently. The arms look slightly better this way, but it ends up making the figure look way too thin in the torso area. Finally, don't be alarmed if Landfill's head looks like the silver paint is wearing off, it appears (from every picture I've seen) that is supposed to look like that. 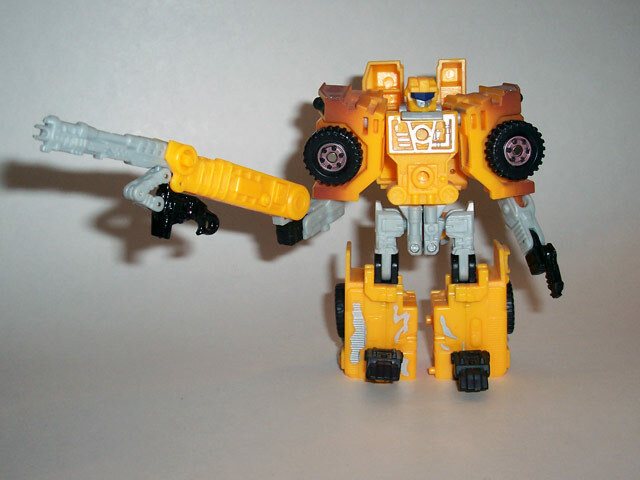 The Build Team leader, Wedge, probably has the only truly good robot mode out of the set. He has as much articulation as you could ask for, has actual hands, and good sculpting. 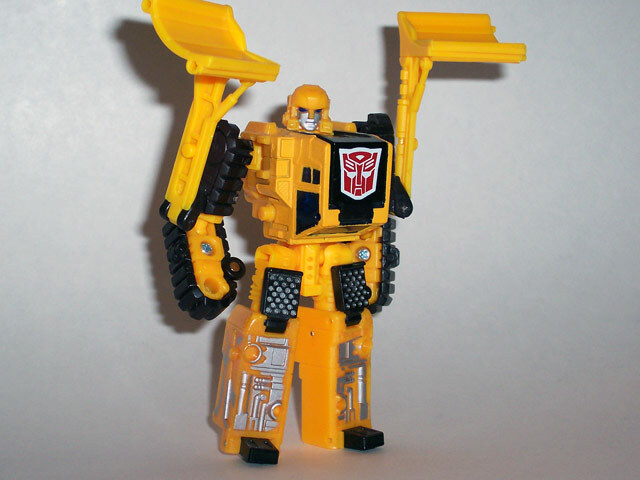 His weapon is Landfill's crotchplate and it's very, very unconvincing. Still, that's much better than no weapon like some of the wimps on the Build Team. Other than an odd weapon, Wedge suffers slightly from being disproportioned due to his chest being the hiding place for Landfill's head. This isn't a major issue and doesn't really detract from the aesthetics of the figure, but it does create difficulty balancing Wedge for display. Grimlock is definitely the goofiest of the four figures and I think the only redeeming thing about the figure is the unique head sculpt. The arms and legs are just awkward and ugly. The hips look weird, the legs don't balance well, and the arms bend at all the wrong angles and pretty much have to remain by the figure's sides. For more on Grimlock, read this review. Heavy Load doesn't so much have a bad robot mode as he has a really bad weapon. His dump truck bed turns into a big claw. How impressive. The robot mode isn't that great, but it's at least on par with a G1 figure. The arms move some and the legs are pretty stiff and brick-like, but the articulation is nowhere near as bizarre as Grimlock's. Heavy Load, like Grimlock, lets me see why people were cheesed off at having to pay $10 for each of these figures to make a mediocre gestalt. Hightower is somehow my favorite out of the four individual robots. While his mold works pretty much exactly the same as Heavy Load's, he has something the other three robots in the set don't have - a good weapon. Actually, he doesn't have just one, but two weapons. 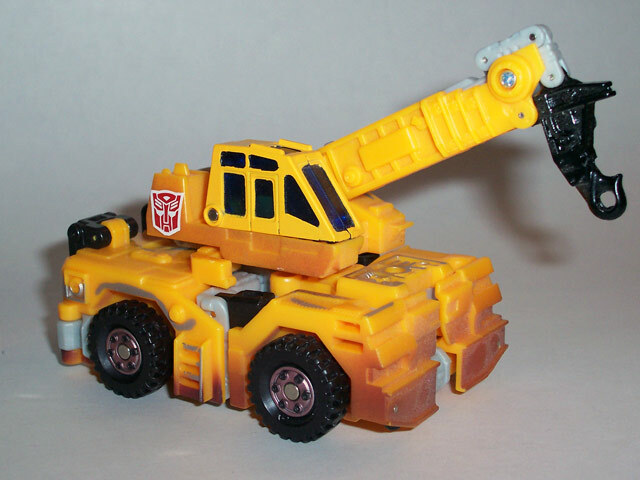 His crane part turns into a rifle and there's a pistol hidden in his vehicle mode's cab. The fact that he has guns instead of a wacky claw, disjointed arms, or a robot's crotch for weapons really puts the figure above the others in my eyes. He still has the other problems Heavy Load has, but at least he has some firepower. 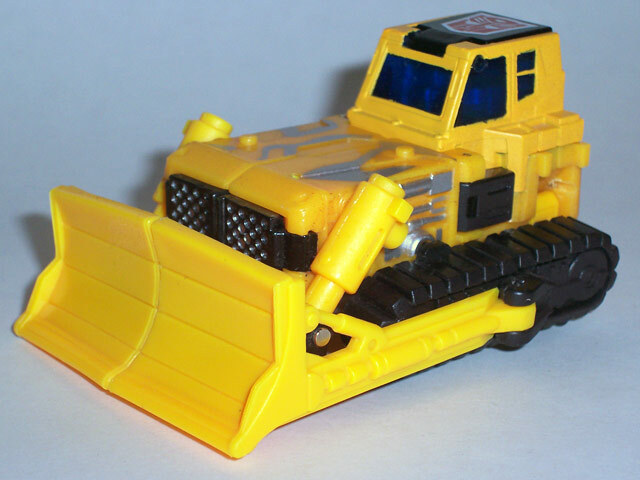 Wedge's vehicle mode is a run of the mill bulldozer and it looks fine and does a good job at hiding the robot mode inside. The paintjob is similar to what you'd see on an actual bulldozer, but the silver patches of paint are most prominent on Wedge and aren't necessarily things you'd see on a real bulldozer. I'm still not sure what the silver patches are intended to be, but I've always assumed they were supposed to be places where the orange paint had worn or been scraped off and revealed the metal underneath. Grimlock's vehicle mode is much better than his robot mode, but I've had issues with it staying together and still can't seem to get the treads to look right after transforming it. Again, see Denyer's review for a more about Grimlock because I hate the thing. 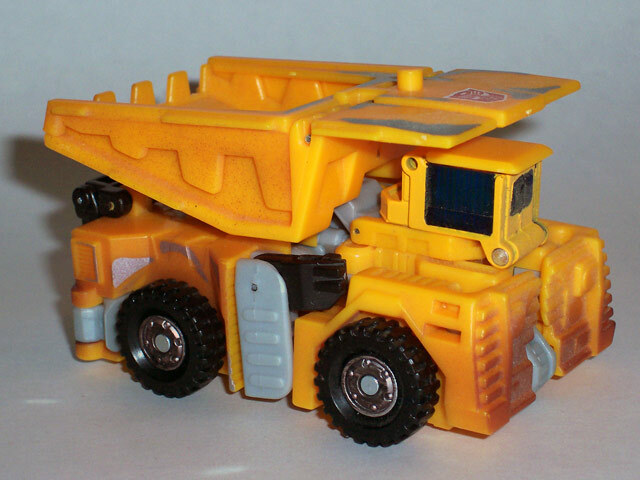 Heavy Load also has a better vehicle mode than robot and passes for a typical dump truck. I like this vehicle mode because it looks real and just doesn't have any significant flaws. Hightower's vehicle mode is good, but sadly his rifle looks disproportionately small as his crane. I also can't recall ever seeing a crane that looked like Hightower, but, without going to Google, I assume it's based on something in reality. The cab that holds Hightower's pistol seems kind of prone to come loose in this mode for some reason. Transformation: 9 - The individual figures range from simple to complex, but each is well designed and Landfill certainly had some thought put into his design to accommodate four possible configurations. Durability: 8 - While this version didn't disintegrate upon transformation, there are still a few weak areas and the plastic feels cheaper than what was used on the original version of Landfill. 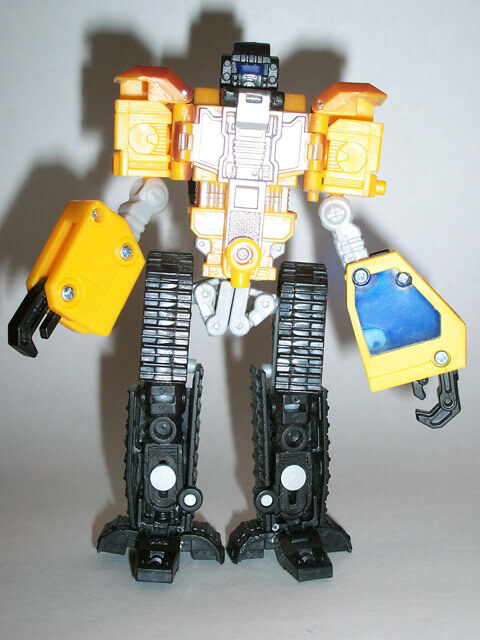 Fun: 9 - Four robots with construction equipment alternate modes that also form one big robot. What's not fun about that? Price: 10 - $15 for four deluxe-sized robots that form a gestalt? Haven't seen much better values recently in Transformers in retail. Summary: 8 - If you didn't pick up Landfill already and can find this one on the cheap, it's well worth getting.